Over the past 12 months, the Pacific Institute – in partnership with its West Africa partners NewEnergy, World Vision, Rural Aid, Pronet North, and Water and Sanitation for Africa – has been conducting learning sessions to develop the Community Choices decision support tool to help communities and NGOs make informed decisions for their water, sanitation, and hygiene challenges. The internet-based prototype includes many field-proven technologies and is designed to empower water, sanitation, and hygiene (WASH) professionals and communities to choose technologies based on their responses to a set of questions that reflect cultural, socio-economic, hydrological, and religious factors. 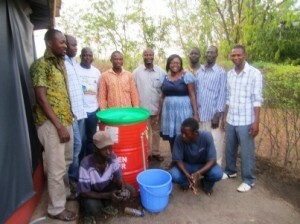 Participants standing in front of an implemented water solution (Biosand filter) recommended by the CCW tool. The prototype version of the Community Choices for Water tool has been developed and tested in three communities in northern Ghana. The communities are Cheshei in the Tamale Municipality and Dinaso and Gofal Sahi in the Wa East District in the Upper West Region. The goal of the pilot was to test the prototype in the communities to evaluate how workable and effective the tool is to NGOs, local governments, and communities. Prior to going to the communities, two-day training was organized for Pacific Institute partners in Tamale. Participants were briefed on community entry, onsite water quality testing, and how to administer the prototype tool to the communities to make decisions. The WASH needs in Cheshei, Gofal Sahi and Dinaso are enormous. 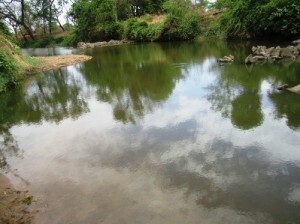 Cheshei has a pond which is about four kilometers away. 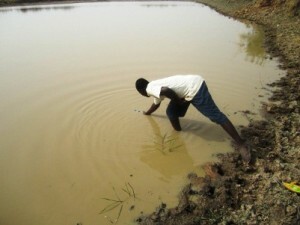 Both people and animals compete for water from the pond, and during the dry season, the water is so muddy that using it for drinking is almost impossible. The animals defecate directly into the water, which could add bacteria and nitrate pollutions to the physical pollution already observed. In Gofal Sahi, the community members depend on a river for their water supply. Both people and animals compete for the same water source which is about 200 meters away from the community. During the rainy season, the river gets so cloudy that community members find it difficult to treat the turbidity before drinking. 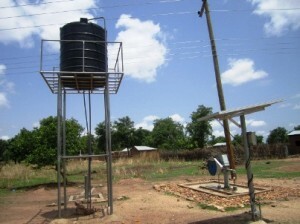 In Dinaso, there are two boreholes and a hand-dug well. One of the boreholes fitted with a solar pumping system has very turbid water. Due to less waiting time at the water source, most community members prefer to access the turbid water. Interaction with the communities revealed that community members know that their water from the various sources was not suitable for drinking. The community members cited: (1) brown/cloudy color; (2) water related diseases such as diarrhea and vomiting; (3) unprotected nature of water where animals also enter into the source to drink and defecate as evidence of pollution. In order to treat the water, alum is always added to the water in containers to settle the dirt, and water is filtered using clothes. 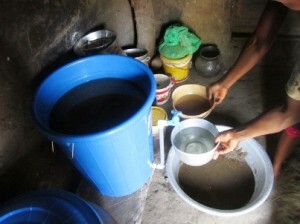 Having filtered the water, some of the households boil the water before drinking while others consider boiling as expensive and time consuming. In each of the pilot communities, 20 households were selected after several community meetings. Pre-pilot questionnaires designed to assess the household knowledge on water treatment technologies were administered to each of the 20 households. Further, 10 of the 20 households were selected to go through a walkthrough of the prototype Community Choices for Water (CCW) tool.After households responded to the set of questions in the CCW, they are given the tool-generated recommendations for a set of water treatment solutions. Community members are well informed about their contaminated water source. Water quality test on community water sources confirmed households’ knowledge of water contamination. It takes between 9-30 minutes to walk a household through the CCW. The addition of alum changes the taste of their water according feedback from the household. Community members are surprised to hear that Moringa seed is a treatment technology. There are some Moringa trees in Cheshei which could be useful for the community. Others were quick to say that it could reduce the bad taste they get from using alum to treat their water. Community members believe CCW is useful because they learned new ways to treat their water. Pilot households were eager to spread messages of the technologies to their colleagues. Some community members in pilot communities appealed to the Pacific Institute and its partners to reach out to other communities with the tool. Households are willing to buy materials for the recommended solutions but due to extreme poverty, some households could not afford to spend any money to purchase materials to implement recommended technologies. Some households cited 5-10 Ghana cedi as an affordable price to spend on implementing a chosen technology. Though the recommended solutions have been obtained, vendors for the technologies are not available. The closest vendor’s shop is in Tamale, where Pure Home Water Group sells only Ceramic filters. Therefore, different solutions from the recommended technologies could not be implemented within a given community due to lack of vending shops for different materials for different technologies. The presence of a borehole or closed hand-dug well in Dinaso results in low interest for household water treatment in the community. A question on household interest in treating water before consumption should be added in CCW. Filter cloth should also be added as a method of physical treatment technology. Literacy rate is very low in communities and more pictures should be introduced in CCW to enhance household choice of the solution to implement from the recommended technologies. NGOs and government officials should use CCW to assist communities make WASH decisions due to low literacy rate and lack of internet access at communities. Incorporate lessons learned from the field to refine CCW. It is important to identify and encourage technology vending shops to establish shops across northern Ghana. Identify funding group who could assist poor households to implement recommended solutions. Identify and partner with groups who are interested in household treatment to use CCW. Support partners in West Africa to promote the use of CCW. Conduct a pilot test of CCW in Burkina Faso.